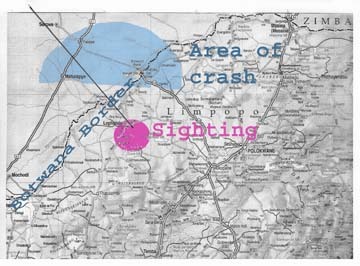 The Academy has investigated a very important event that has come to light: the sighting of a vehicle crashing on the South African-Botswana border. Strange and terrifying sounds of what many believe to be a Ufo that was about to crash flew low over their heads on December 30, 2006. According to the current witness Leonie Ras, the object was singing like a ‘million turbines’ and was heard for miles near the city of Lephalale, a new area of development supporting a growing population of some sixty thousand.